The last three screens have outlined some aspects of the historical context that gives the background for what CST has to say about issues of business and economics. As a way of concluding this ‘contextual’ stage of the pastoral cycle in this unit, you are asked to read the chapter on the economy by David Matzko McCarthy in McCarthy’s book, The Heart of Catholic Social Teaching. This ranges widely over the topics you have studied in both Unit 4 on working life and this unit. Much that you will encounter in it should make more sense than before you started study of the module. You can see the chapter as way of reviewing what you have learned before moving on. First, Adam Smith’s theory according to which self-interested individuals are parts of an economic mechanism that generates the best overall result. This inspired ‘capitalism’, an economic system in which people are understood primarily in terms of their economic relations. He says that seeing people in this way is an error that Pope John Paul called ‘economism’ (p. 131). Second, Karl Marx’s theory of history progressing through class conflict, which will be transcended only in a final communist society in which in which the interests of the working class are fully met. This inspired what became the ‘socialism’ of eastern and central Europe during the Cold War – although in practice this did not come close to making Marx’s ideal a reality. Third, the vision of CST in which the metaphor of the human body, as used by St Paul (as you saw in Unit 1), conveys what it means to speak of the common good – human beings defined not mechanistically nor in terms of class structure, but as persons whose wellbeing is found in free participation in the ‘social body’. As you read notice that, as well as looking at Rerum Novarum, McCarthy brings in Quadragesimo Anno, an encyclical which marked its fortieth anniversary in 1931 (pp. 136-7). I mention this because we don’t give much attention to Quadragesimo Anno in this module. (You have the opportunity to do so in the ‘Public Responsibilities’ module). It is well known for its statement of the principle of subsidiarity, which is certainly significant for CST on economic life. McCarthy’s discussion contributes further to setting in historical context the more recent texts of CST that you will look at in the rest of this unit. You will see that the ‘Discussion’ at the end of the chapter focuses on the Fair Trade movement. I shall comment on this after the reading. 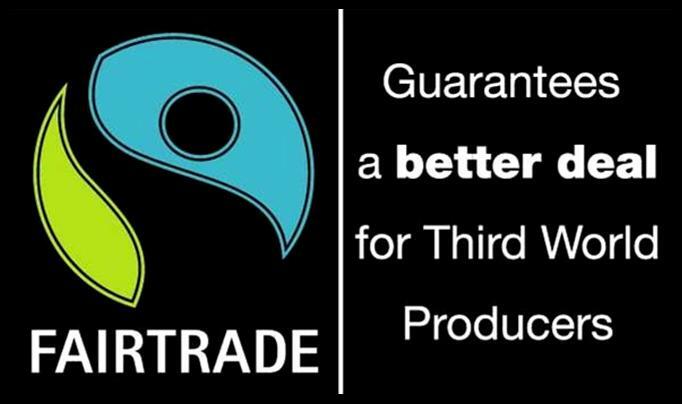 You will almost certainly be familiar with Fair Trade products because a wide range of them have become available in most large supermarkets in Britain over the past 20 years. Among the most prominent are coffee, tea, chocolate, bananas and fresh flowers. Fair Trade goods usually bear the logo above, which you’re probably familiar with. As that list implies Fair Trade products can be either commodities or processed goods. They are products supplied from relatively poor countries to consumers in affluent countries for which a guaranteed minimum price is paid to the producers, so that they can receive a living wage and work in decent conditions. Keep the example of Fair Trade in mind as you are reading from CST texts in the next part of the module. Also keep in mind the examples I gave earlier of companies that are not strictly ‘capitalist’. As the three bullet points above on this screen show, McCarthy portrays Catholic Social Teaching as an alternative to both the capitalism inspired by Adam Smith and the socialism inspired by Karl Marx. He presents it, in effect, as a ‘third way’, and he uses this phrase, although not directly in describing CST, on p. 138. But distinguishing only these three views raises a major question. Do these three represent the only main positions that need to be considered in debate about the economy? McCarthy’s premise that there are only these three is very much open to challenge, not least in the light of the experience of the UK and similar countries, especially in the English-speaking world, during the whole of the post-WW2 period. As we have seen, Thatcherism in the 1980s represented the revival of Smith-inspired capitalism, now known as neoliberalism. But what this was a reaction against in the UK context cannot plausibly be regarded as Marxist socialism – even if some neoliberals see everything they don’t agree with as that! Rather, the form of economy in the UK between 1945 and 1980, and also that which New Labour stood for later, under Blair and Brown, can be seen as different from either of those. It can be called ‘social capitalism’. This term is appropriate because it labels a position which accepts capitalism – in the narrow or strict sense – but which, unlike neoliberalism, insists on strong state regulation in order to achieve social outcomes. These outcomes are basically of two kinds: first, legal protections for workers against exploitation and, second, high quality public services. As you may know, New Labour explicitly took up ‘the third way’ as a label describing its approach, as did the administration of President Bill Clinton in the USA at the same time. This made sense in the post-Cold War context – they wanted to distance themselves from both neoliberalism and from discredited state socialism. ‘Social capitalism’ raises a really important question for the rest of this module. Do ‘social capitalism’ and CST basically represent the same position on economic life, or are they, despite some apparent similarities, deeply different? In other words, is CST clearly distinct from all three of laissez-faire capitalism, Marxist socialism and ‘social capitalism’? If it is, and if social capitalism is a ‘third way’, does CST really represent a ‘fourth way’? What is your first reaction to this question? From what you have studied so far, in units 2 and 4 as well as this unit, do you think the positions of Blairite ‘social capitalism’ and CST on the economy are basically the same? Or can you see any real differences? Having given a good amount of time to the second stage of the pastoral cycle, i.e., to the historical and social context in which issues about business and economics now arise, we come to its third stage and so turn to the documents of CST. You might wish to scan the screens from 5.1.3 to here again, as a reminder of what we’ve looked at, before you move on.